Another week has come to an end, and we have started to bid farewell to Autumn. The leaves which have been a golden forest carpet were swept up by the grounds-people at Fulham Palace, with help from the Little Forest Folk of course. As the leaves have stopped falling from our favourite (and now bare!) tree, we decided to create our own falling leaves, throwing bundles of golds and browns into the air and running underneath. We created some beautiful leaf art using crayons and had conversations about colour and texture. We even made our own leaf tickets for the Puppet Show! The puppet theatre was grand success, with the hit production starring a tiger and a sheep – coming to the West End soon! Physical development was the foundation for many of our experiences this week. The children are becoming confident in navigating our forest site, and they are starting to calculate and manage risks. The children were particularly interested in pulleys and swings, and as well as being great for the children’s motor skills, these activities encourage turn-taking, of which the children are gaining a good understanding. The children love to be involved with setting up, helping tie ropes and choose safe locations for our pulleys! The children are responding well to our routines, helping educators to pack up, and preparing themselves for meal times by collecting their water bottle and washing their hands. Having a familiar routine gives children a sense of security, whilst the forest environment allows for freedom and exploration. In the morning, the children are now beginning to recognise their name and picture on our 'Tree Cookies’, and hanging their bag up beside it. Our meal times are running smoothly, and the children are thoroughly enjoying our forest food – so much in fact that Harry ended up bathing in it! What a sight! We had a very exciting Thursday when some of the Palace grounds volunteers showed us some stag beetle larva they found whilst clearing debris near our basecamp. The larva were bigger than a £2 coin, and we learned that the stag beetle remains in larva state for around 7 years, before the beetle emerges living only for a few short weeks. The children are always fascinated with the bugs, insects and other mini beasts who share our forest – we will continue looking at mini beasts closely over the coming weeks. We hope you are enjoying our "Snaps of the day" on Tapestry. We find the snaps to be a lovely way to connect with families, and show you just what your little one gets up to each day. 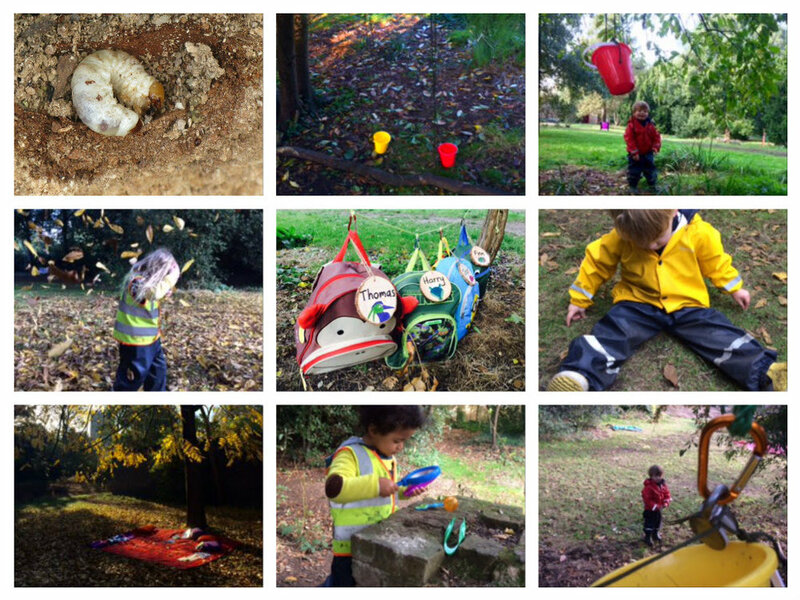 For any families unsure of what our snaps are, they are a photo or video (a ‘snapshot’) of the child engrossed in play and learning during the day at Little Forest Folk. Each day, a picture of your child is uploaded to Tapestry, with the title ‘Snaps’, so you can see what your child is doing in the forest. This can be a helpful conversation starter on the way home, or give an idea as to your child’s current interests. We do not ask the children to smile at the camera, rather, we aim to capture the moment as it is, along with the magic of the forest and level of engagement of the children. Monday 19th December, during the day. The weather for next week is looking crisp and a little chilly, so please do wrap your little ones up nice and warm. Check out our recommended winter kit list and remember to use your LFF discount codes. As many of you already know, Lil is our Head of Nursery Expansion and is currently heading up our team at Fulham but we're delighted to say our new Trainee Manager Marlon has now started with us this week. Marlon has thoroughly enjoyed his first week at Little Forest Folk, and along with our Deputy Manager Conor and the team, is very excited to get to know our families and children and see our Fulham site grow. We hope you enjoy your weekend, have lots of fun on Bonfire Night, stay safe!